beautifully unique, consistently dynamic, and authentically yours. handmade piece of art for your collection. 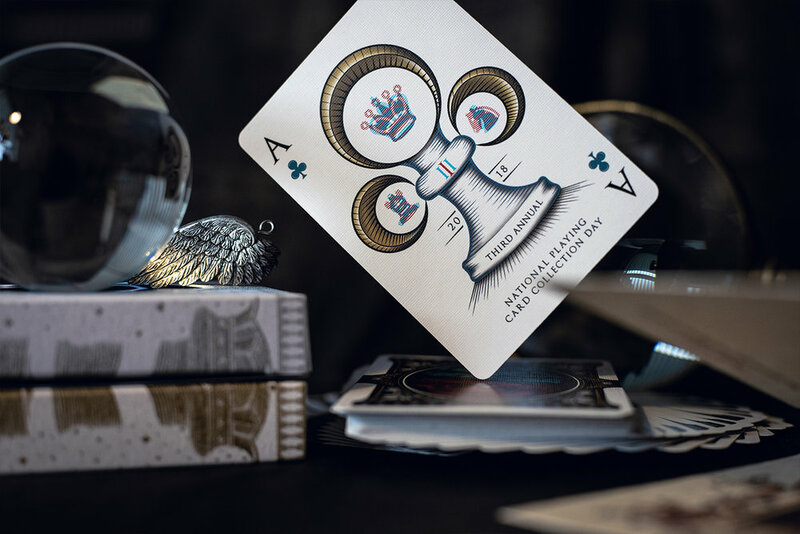 Inspired by the intensely curious works of Escher, this deck was meticulously designed and illustrated to create a reality-bending deck in the most sincerest form. Good illusions blur the lines between dual designs, trying to persuade you to see something not quite there. But great illusions solidify those lines to transform these designs into unmistakably new perspectives. Large windows blend the boundaries between cards and box. 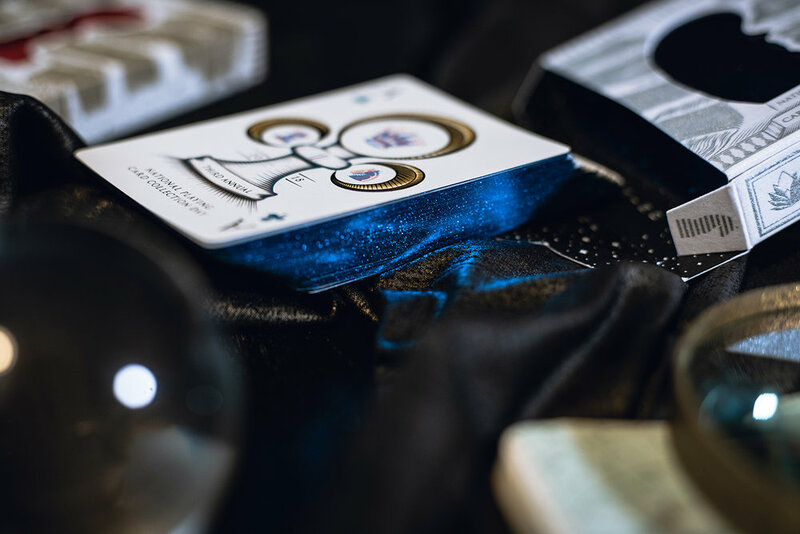 Each deck in this year’s collection contains a singular perspective that controls the “reality” of the designs inside it, creating a stunningly visual change to the actual cards themselves. 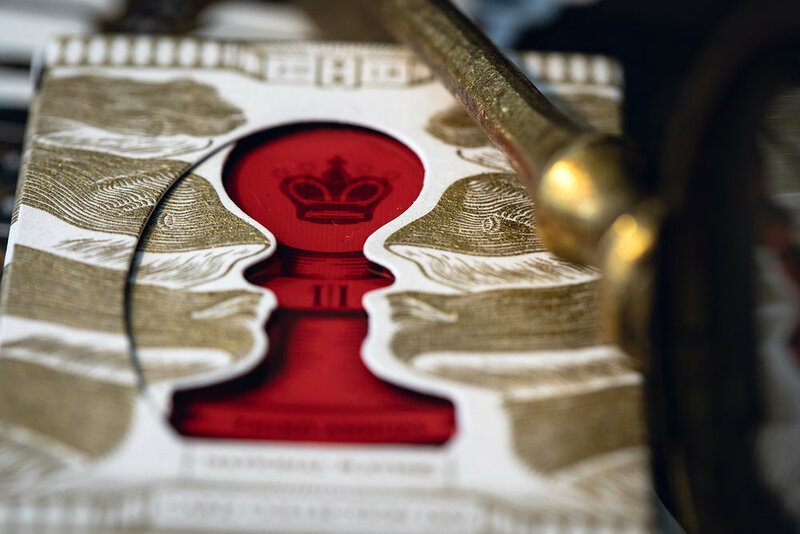 Will you be of the King’s persuasion and see his crown ? 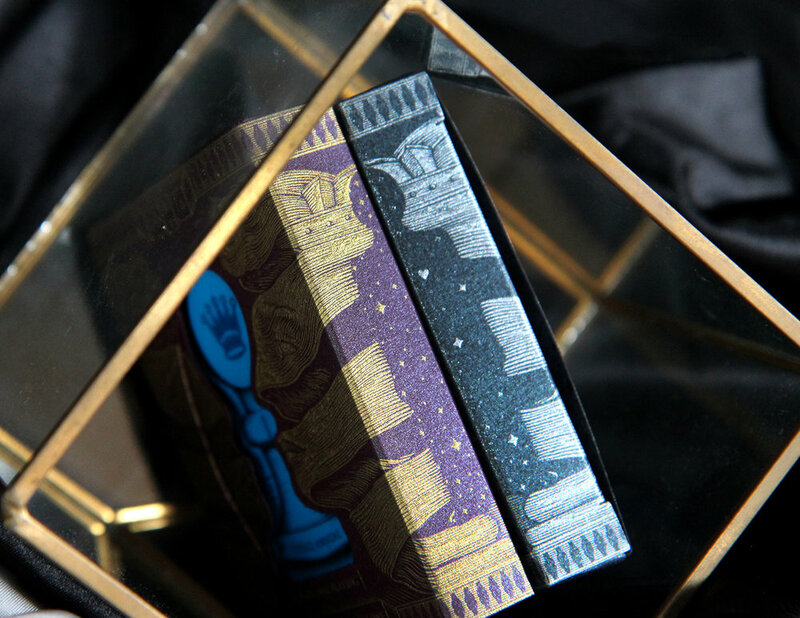 Or will your deck be captured by the Queen revealing a completely DIFFERENT set of pieces in tow? 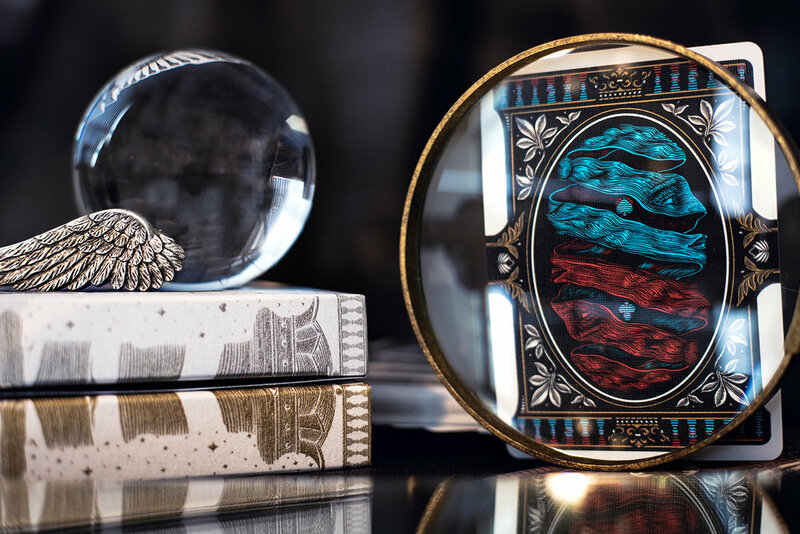 Bring home the world’s first dual perspective changing deck and keep a piece of playing card history for your shelf. This deck truly takes the genre to a whole new level. A quick video shows the utterly stunning visual change side by side between one “reality” and another to truly appreciate the amazing results these small perspective boxes can do. 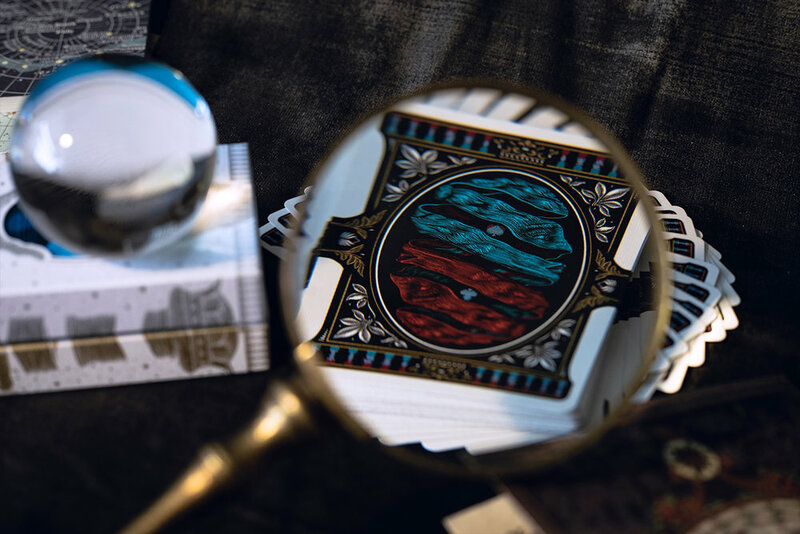 Add a dash of suspense to your card collecting with this year’s mystery deck! But worry not because EVERY SINGLE deck is absolutely astounding. This mystery deck comes in different box colors to keep each deck unique. Who knows which color you will get! If you order more than one I will do my absolute best to ensure that you will get different colors to avoid repeats if possible. Estimated ship date November 5th. 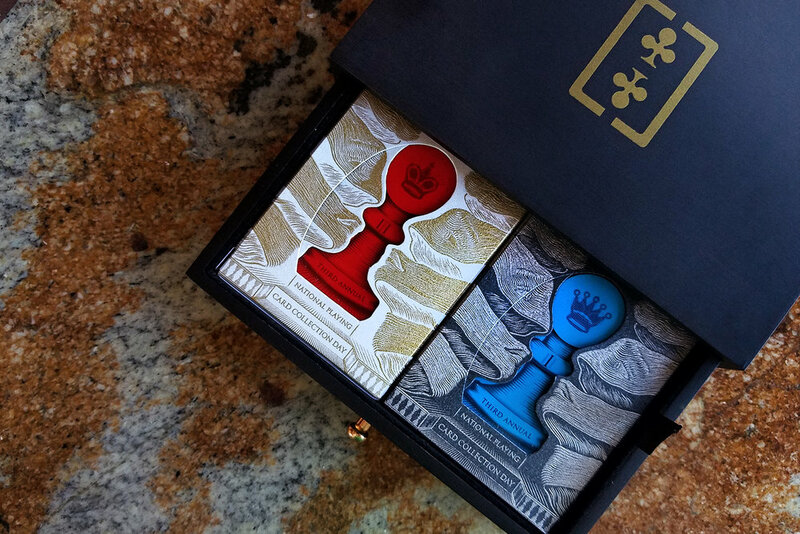 Get a pair of gorgeously engraved decks that balance the dueling perspectives of King and Queen. 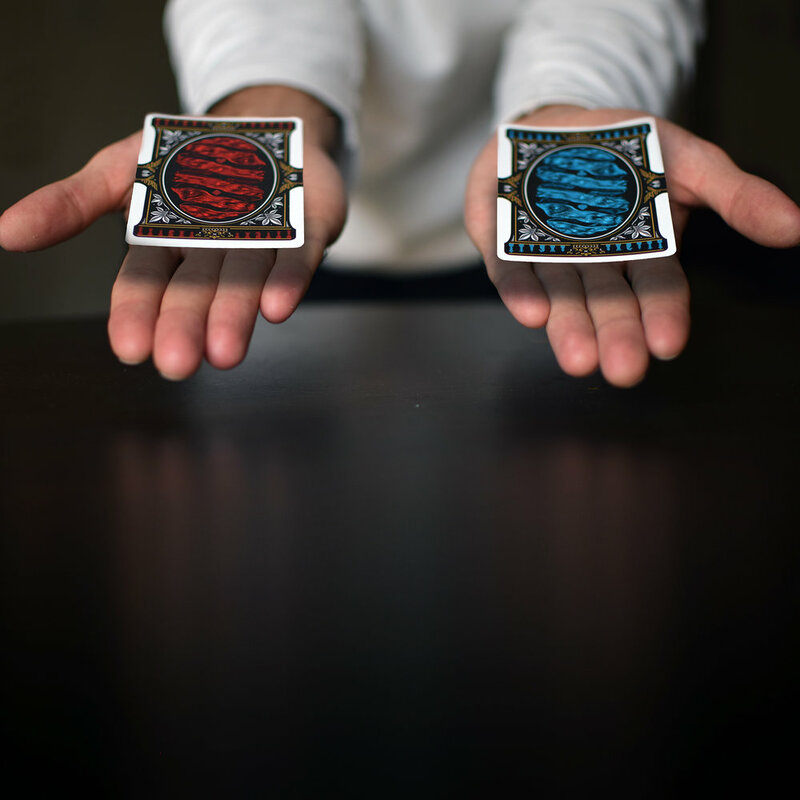 This mystery combo comes in (2) different box colors to keep each pair unique but will guarantee the red blue pairing to create the perfect design experience. 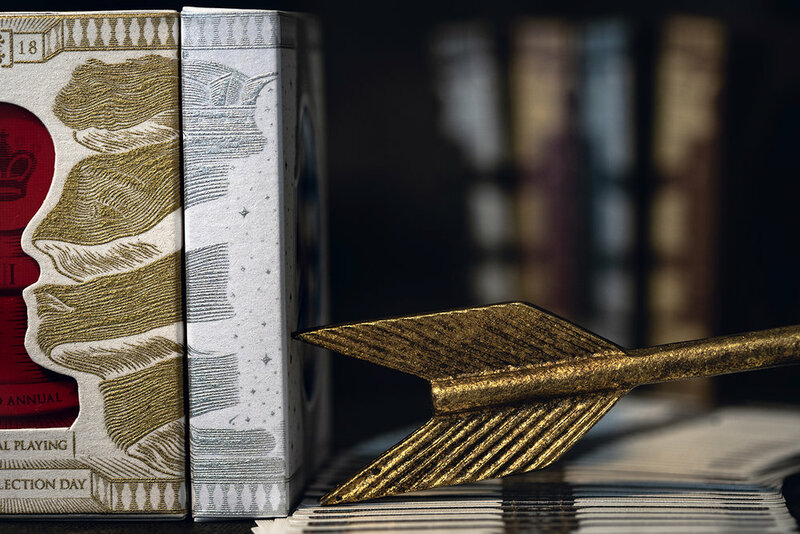 Receive (1) Standard Deck + (1) Hand Gilded Deck. If you order more than one we will do our absolute best to ensure that you will get different colors to avoid repeats and match numbers if possible. Limited collector’s box set upgrade available. Estimated ship date November 5th. Each deck is individually hand numbered out of 500. Complete the entire 2018 Collection with this selection. 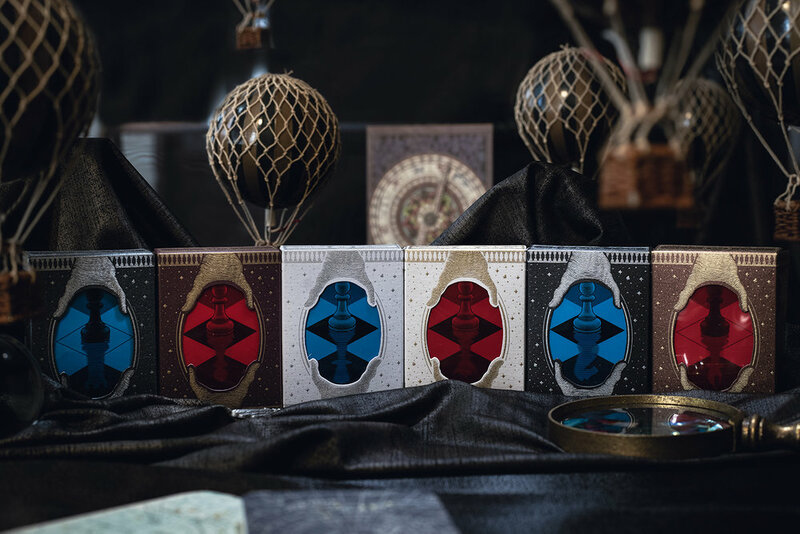 Get EVERY color, EVERY design and EVERY gilding in the set. 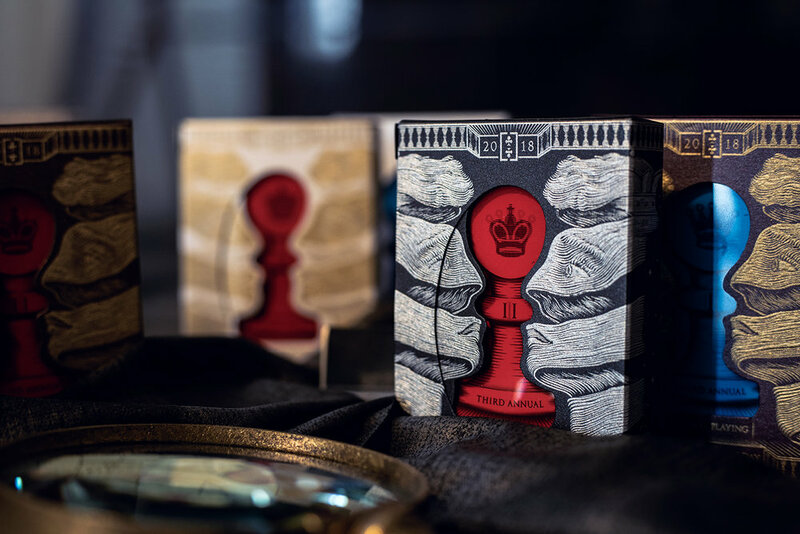 The collection comes with one of each of the 6 decks, represented by a different chess piece to create a full set that can be displayed face wise or edge-to-edge. Numbers will be given out lowest to highest in the order that they are received. Matching numbers will be given wherever possible but cannot be guaranteed. Estimated ship date November 5th. Not just beautiful, these cards also help support the arts. Portfolio52 is a completely FREE service that helps you discover new decks, manage your collections, and trade with others. Tools like these help make card collecting easier, more informed, and of course a lot more enjoyable. However running and maintaining these services cost money. In order to keep these tools free for everyone these decks are offered for sale once a year as a way to help gain these donations from the community while still giving back something that collectors would truly want. They're our way of asking for donations while still giving amazing value back to the community. So when you purchase a NPCCD deck you know it’s going towards a good cause! 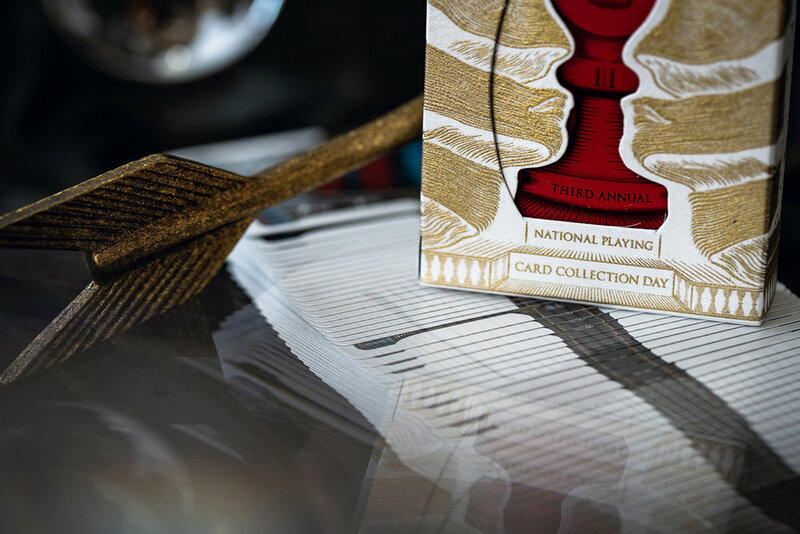 To us the NPCCD deck acts as a badge of honor in our card collections and acts a sign that we helped support the art of card collecting. Due to the handcrafted nature of the decks, please allow up until the end of the month for shipment.